Definition at line 52 of file llprefsvoice.cpp. Definition at line 59 of file llprefsvoice.cpp. 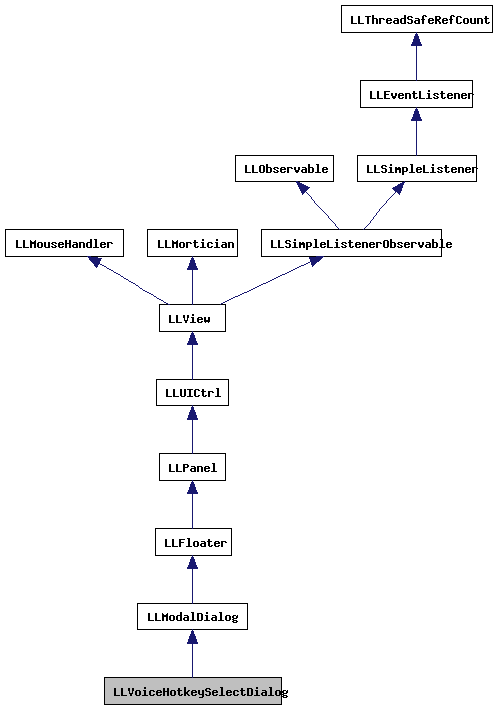 References LLUICtrlFactory::buildFloater(), LLPanel::childSetAction(), LLPanel::childSetFocus(), LLFloaterView::getFrontmost(), gFloaterView, gUICtrlFactory, mOldFrontmost, and onCancel(). Definition at line 205 of file llprefsvoice.cpp. References LLFloater::close(), FALSE, MASK_CONTROL, mOldFrontmost, mParent, LLFloater::setFrontmost(), LLPrefsVoiceLogic::setKey(), and TRUE. Definition at line 198 of file llprefsvoice.cpp. Definition at line 71 of file llprefsvoice.cpp. References LLFocusMgr::getKeyboardFocus(), gFocusMgr, LLFocusMgr::removeKeyboardFocusWithoutCallback(), and LLFloater::setFocus(). Definition at line 56 of file llprefsvoice.cpp. Referenced by handleKey(), and LLVoiceHotkeySelectDialog(). Definition at line 55 of file llprefsvoice.cpp.